– Voulez-vous du café ? – J’en ai déjà. 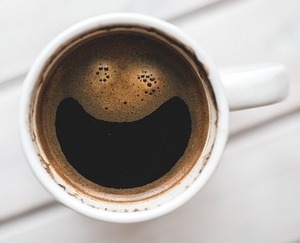 – Do you want some coffee? – I already have some. – Combien d’enfants as-tu ? – Je n’en ai pas. – How many kids do you have? – I don’t have any. En most commonly replaces de plus a noun, though in certain constructions it can replace just a noun or even a phrase. En replaces an indefinite or partitive article plus a noun. J’en ai une. He’s looking for ideas. > He’s looking for some (of them). Tu manges des épinards ? > Tu en manges ? J’en veux aussi. Are you eating spinach? > Are you eating some (of it)? Are you eating (some of) it? 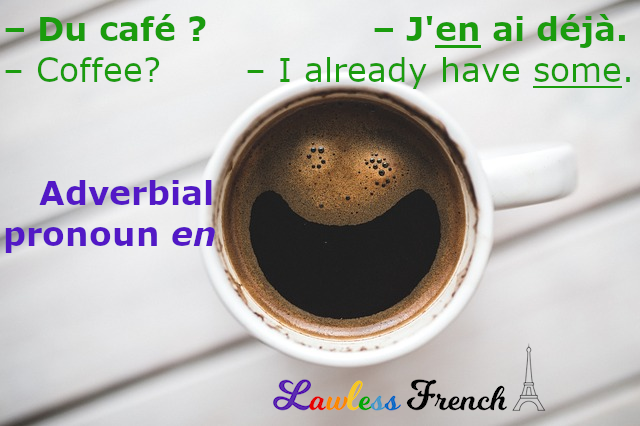 While the words (in parentheses) are optional in English, en is required in French: Il cherche, J’ai une, Tu manges, and Je veux are not complete sentences. The person you’re talking to would be left wondering "you have one what?" or "you want what?" despite the seemingly obvious answers. En provides an essential link to the noun in the sentence that precedes it. En replaces the noun after a number. Note that the number itself is maintained at the end of the sentence. J’achète 5. I’m buying 5 bottles. > I’m buying 5 (of them). J’ai une. I have one daughter. En replaces the noun after an indefinite adjective or replaces de + noun after an adverb of quantity. Again, the adjective/adverb itself is tacked on to the end of the sentence. J’ai plusieurs. I have several black jackets. > I have several (of them). L’hôtel a beaucoup de charme. > L’hôtel en a beaucoup. L’hôtel a beaucoup. The hotel has a lot of charm. > The hotel has a lot (of it). En can replace de + a place or an adverb of place. > J’en rentre. I’m returning home from Paris. > I’m returning home from there. > Il en vient. He’s coming from there. Que pensez-vous ? What do you think about this decision? > What do you think (about this)? J’ai besoin. I need a pen. > I need one / it. En can also refer back to a preceding sentence or clause. Elle est enceinte. J’en suis certain. She’s pregnant. I’m certain of it. Il a perdu son emploi, et j’en suis malade. He lost his job and I feel sick about it. There are a number of verbs and expressions which include en with no apparent antecedent. Note that some of them may even be followed by de plus a noun. En is also a preposition.